Why You Should Be Using Video In Your Sales Funnel! Video Marketing is all the rage at the moment, and every digital platform is trying to make themselves video friendly. Whether it be Facebook, Snapchat or Instagram – video is the content form everyone is ready to target. Yet, even with this push for everyone to go after the best video content they can create – almost nobody is using video to sell. Selling your company or product is the challenge that comes along with every business. To sell on a website, a specific style of writing known as sales copy was developed and took over landing pages. With almost every sales page looking essentially the exact same, being good isn’t enough. Instead it is key to be different. That is where video can come in. Putting video on your landing page is not a groundbreaking strategy by any means, nor is it the most uncommon thing. The issue is the number of landing pages which use either poor videos or use good videos yet in the wrong way. The Stats Say It Works! 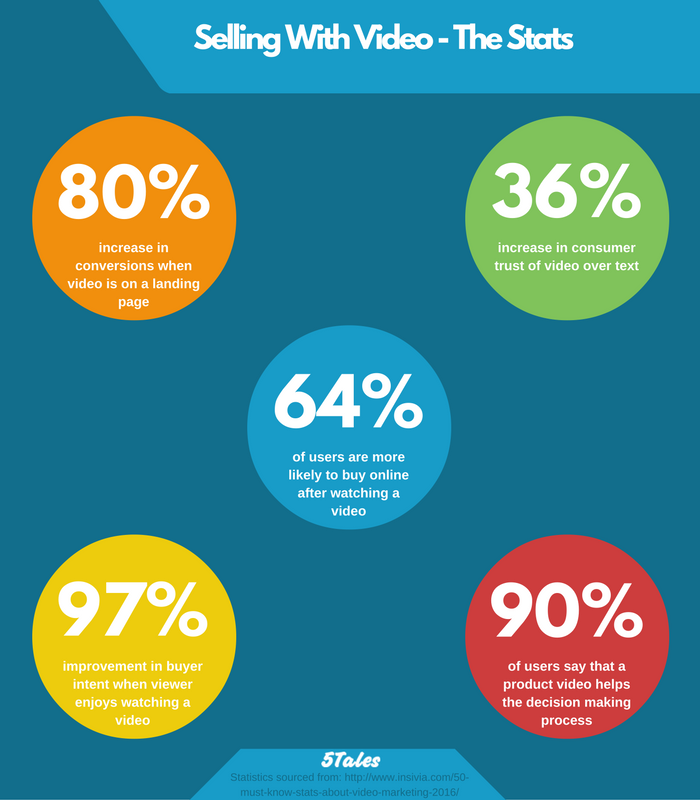 Video definitely helps you sell when you do it right, and here are the numbers to show it! The ability to use video as a marketing tool is well known at this stage. With an 80% increase in conversions, the ability to 2x or 3x click through rate and plenty of stats showing improvements in trust and interaction – video sells. On a landing page, being able to take a 1-2 minute video and convey all the benefits of a product or company values, solves the issue of having a visitor get far enough down the page to find your unique selling point or special offer. Why Don’t More People Use Video On Sales Pages? Like most great ideas and potentially successful tactics, the reason for more businesses not jumping onboard is a lack of understanding. On the outside, video seems as though it requires a large knowledge and skill base – when in reality almost anyone is able to create quality content. The most common misconception about video creation is that it requires a large number of skills or a course to do. At the end of the day, great video comes down to three elements. Grabbing and holding the attention of a viewer is key to quality video. In a world which is constantly filled with distractions, getting anyone to commit to watching your content requires both a topic that is engaging as well as delivering the content in an engaging way. If the content is engaging in format, but there is no value provided for the viewer then you will learn quickly that getting a return visitor is impossible or the change of getting any value from a viewer (e.g. email address) is very low. The way to think about it is to use your common sense and create content that is both citable and actionable. Any content that someone can directly action and then refer to in conversation or talks with a co-worker is certainly adding value. There is nothing more crucial than clear audio and stable video. Crackles, wind noise and background conversation is killer when it comes to audio – while a shaky camera destroys a video. You do not need Hollywood level equipment, but using your phone plus a tripod (Octopus Phone Tripod) and a microphone (Video MicMe Go) would help raise the quality more than you may think. As with most things in business and in life, the greatest challenge is getting started. After getting your feet wet and understanding what it takes to make a video, improvement comes faster than you could ever expect. You will never know whether video is for you until you start trying and see what comes out of it. So get out and start recording!